One of Metlab’s customers in the South shut down their heat treat equipment for major repairs. The furnaces are expected be down for about four weeks. 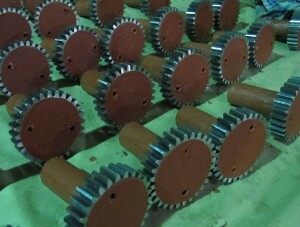 Their product is gears and pinions, ranging from ¼ pound to about 50 pounds in weight, physical size about 2” in diameter to 60” in diameter, 1” to 24” thick. They also make pinion shafts, and their customers are industrial manufacturers of motors, transmissions, hand tools and a general cross section of power transmission equipment. When not in a shutdown mode, this manufacturer offloads their over-capacity to Metlab as well as their large size gears which they cannot process themselves, particularly nitriding and carburizing and hardening of large power transmission gears. During their shut down, they off load their entire production to Metlab because of our furnace capacity, flexibility, quality and ability to process multiple batches quickly. Metlab essentially serves as their in-house heat treat source. While many customers think of Metlab as a large gear heat treat company, this is not the only area of expertise as evidenced by the ability to step in and assume this role for customers who require smaller part processing. During this shut-down period, Metlab is expected to heat treat about 4,000 pounds of product a week for this customer, processing 4320, 8620, 9310 carburizing grades of gears and pinions with requirements for shallow effective case depths ranging from 0.010 – 0.020” to deeper case depths up to 0.100 – 0.125” case depths. 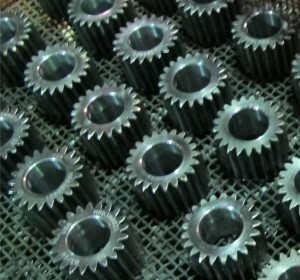 Some of these gears and pinions require masking to prevent areas which require post-heat treatment machining from becoming hardened as well as cryogenic processing and multiple tempering as part of their process. In addition, a portion of the product processed will be straight hardening and tempering of 4140 and 4340 gearing. To expedite the heat treating process Metlab receives the purchase orders and packing slips from the customer as soon as the parts are in the customer’s loading dock, allowing for the detailed process specification and shop travelers to be prepared ahead of time, so that the parts are married up with the receiving paperwork when they arrive. This allows the work to be scheduled well in advance accommodating the just-in-time work flow required to keep the production flow going. Likewise, shipping documentation, including packing slips and certifications for case depth, hardness and microstructure are e-mailed to the customer’s receiving and quality control department so parts are received in advance, minimizing waiting time for paperwork to catch up to the appropriate personnel. This customer is located about 750 miles away from Metlab, making it a one day point for shipping, and as the cost of freight is minimal, the economics are strongly in favor of outsourcing the heat treating. This entry was posted in carburizing, Heat Treating, Nitriding and tagged Outsourcing Heat Treating. Bookmark the permalink.